Try these healthy pizza recipes and share your own vegan pizza recipe because not all pizzas have to be fattening. Looking for a low carb pizza recipe so you don't have to feel guilty about eating that yummy pizza? You're in luck because there are plenty of ways to make that savory pie more nutritious and healthy. Whether you are looking to lose weight with a low fat pizza or just trying to make healthier choices, pizza does not have to be the enemy. In fact, pizza is one of those wonderful foods that is versatile and can be made a hundred different ways – both healthy and well, not so healthy. Choosing whole wheat pizza dough, or an alternative crust, such as a tortilla or portabello mushroom is going to be a great start to your healthy pizza. Of course, not everyone wants to eat a mushroom in place of their pizza crust (I'm one that does not), so a whole wheat crust is a great way to get that traditional crust with an extra kick of healthy. To get a tasty whole wheat crust, you can follow about any pizza dough recipe and substitute whole wheat flour for white. Also, keep your crusts on the thin side, especially if it’s not whole wheat. A cracker-thin crust will help cut back on fat and calories. 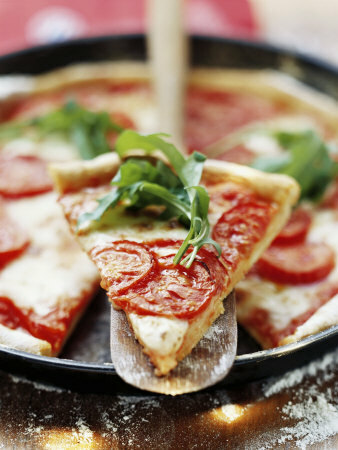 Traditional pizza sauce if fairly high in sugar content, but if you make your sauce at home, or choose a healthier sauce option such as a drizzle of olive oil and garlic, then you are making your pizza healthier without sacrificing taste. Avoid cream sauces such as Alfredo which can be high in fat and calories and jarred pizza sauce which can be high in sugar. A great way to control your pizza sauce ingredients is to make it fresh from scratch. Put a couple fresh tomatoes into your blender and add minced garlic, fresh basil and oregano. Blend it up and you have a healthy, delicious (and inexpensive) pizza sauce. Cheese is an integral part of a good pizza (unless of course, you don’t eat cheese). Eating a healthy pizza doesn’t mean giving up the cheese all together. Just opt for a cheese lower in fat such as mozzarella made with skim or 2% milk and use it sparingly on your pizza. Ahhh, here’s where you can make a big difference in turning a traditional pizza into a healthy one. Instead of sausage and pepperoni, load your pizza up with fresh toppings such as green peppers, olives, onions, spinach leaves, artichoke hearts, broccoli, steamed zucchini, eggplant or tofu. Keep the meats to lean ones like grilled chicken, sirloin, lean ground beef and lean ham. Try and omit the fatty meats like pepperoni, sausage and ground beef (unless it's lean). Or make your pizza with seafood like grilled shrimp or salmon. Tip: *Homemade pizza typically doesn't have the grease that restaurant pizza has, but you can still dab off any grease that's on the pizza with a paper towel. Soak up a few extra calories! Here are a few healthy pizza recipes that will get you enjoying a delicious pizza without sacrificing the taste! Lean turkey meat and low-fat mozzarella cheese make this pizza healthy and low in fat, yet full of flavor. Looking for a no-meat, no-dairy pizza option? Try this tasty vegan pizza recipe. Need a low-sugar, healthy pizza recipe option? Look no further.